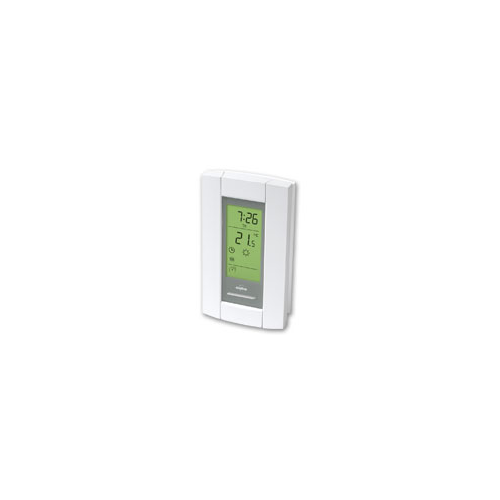 This programmable thermostat is used to control 120V baseboard heating. It offers full individual 7 day programming, Energy Star savings, and can be triggered into vacation/away mode REMOTELY by an automation system or phone in controller. The TH115-AF-120S includes a floor temperature sensor and can be set to use the internal ambient sensor or the floor sensor making it extremely flexible to your needs. 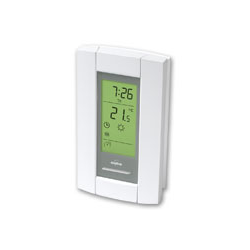 This programmable thermostat will help you save money by only heating when necessary, and the phone control option is perfect for cottages that don't need to be fully heated/cooled when not in use, or for houses where no-one is home during the day. Combined with a telephone controller, now you can turn the heat down to save money when you're at work, on vacation or away from the cottage. Then just call in before you arrive to have the house at your perfect comfort level.